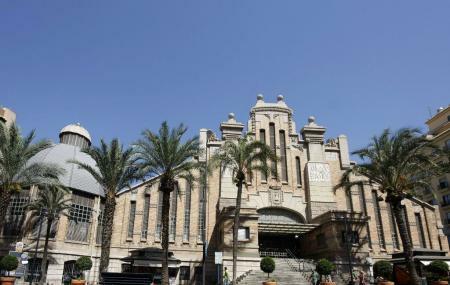 The Mercado Central is the central market of Alicante. The architecture of the market building is modernist-inspired and was built under the supervision of J. Vidal Ramos between the years 1911 and 1912. Throughout the building you will find intricate sculptures and art work. There are around 300 stalls at the market that sell everything related to food! From meats, vegetables, fruits, breads, pastries and cheeses to fresh seafood, you will find it all over here. The fruits and vegetables on display are artistically organized, in a way that you will be tempted to buy everything! Go before noon. After noon, the tourist rush begins. Bus stop near the market. How popular is Mercado Central? People normally club together Archaeological Museum Of Alicante and Ayuntamiento De Alicante Or Town Hall while planning their visit to Mercado Central. People also prefer to start their day with Mercado Central. Monday is the quiet day in the market, none of the fish stalls are open. We have purchased some really to quality meats, chicken and sausages. The fruit is so much better than the UK imports and the vegetables are too quality. Best ever food market that I have experienced! You can park after a little waiting time to the nearest parking and get to the most amazing traditional food market! This is always a very nice destination. Many clean stands with tasty, fresh and colorful foods. Cozy square to spend an hour or so with friends enjoying a snack and a drink (very crowdy on Saturdays noon). The tapa bars in the area are very small and crowdy at that time. Hardly any free tables but people are enjoying the foods standing outside.